Today, before a fun family dinner, I was able to sew the two remaining borders onto Jonathan's (son #4) quilt! This feels like such a major milestone to me. 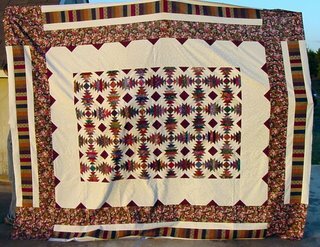 The pattern if from the book, "Pineapple Quilt: A Piece of Cake" by Loretta Smith. The pineapple pattern has always fasinated me, and I had dreams of making a queen size one for my bed. I made a sample block about 15 years with the fabric that I purchase. It seemed overwhelming; I wasn't ready. Then I got into making scrap quilts and loved the texture of the different unmatched fabrics and wondered what the pineapple would look like done in scraps. 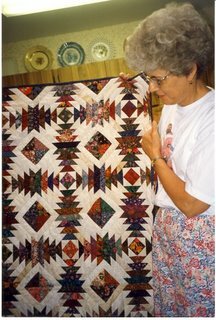 My mother and I have quilted together for years. When my boys were all little we'd join my parents for a camping trip at least once a year. 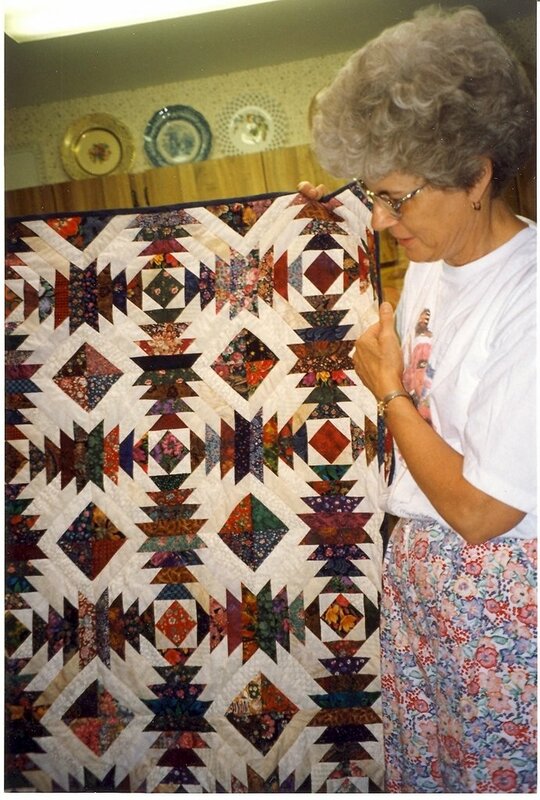 Before the trip my mom and I would decide on a quilting project to work on "in the woods." We'd set our sewing machines and cutting mats...up on the picnic table and have a wonderful week quilting inbetween all our other camping activities. One trip we decided to do the pineapple using our scraps. 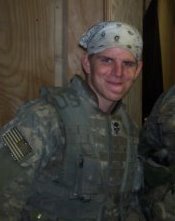 My youngest son, Jonathan, was around 7 or 8 at the time, and he loved the quilt. Although it wasn't his turn for a quilt, I still had to make son #3, Mark, his quilt, I decide to set the scrappy pineapple aside for Jonathan. Well, Jonathan is now 19 and overseas. He's not so little anymore and the twin sized quilt just seemed too small. So after sitting as twin size for over 11 years, it was time to pull out the UFO and get this boys his quilt! My mom (who I don't think has ever had a UFO in her life) has cheered me on every step of the way. 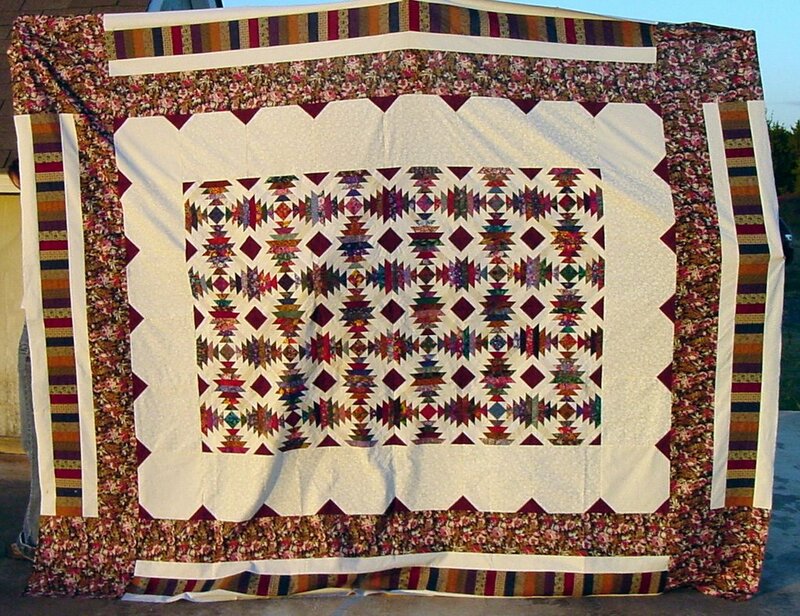 The border simply evolved inorder to make it a queen sized quilt. My new goal now is to get it quilted before his tour is over next summer. Here is my mom in 1995 or 1996 with her finished pineapple which she gave to a friend.